Company name : Sky Bridge Co., Ltd.
Business : Sell, Buy, Rent and Lend houses and all estate services. Hello, I am Moe Moe Nyein. After studing abroad in Japan, I established this company to serve all Myanmar people and foreigners. Our price/service-charge is suitable for local Myanmar people, even for foreigners, the price/service-charge is exactly the same as Myanmar people. If you need car or real estate service, please feel free to contact us. Just tell the taxi driver to go to "Shwe Pu Zun (China Town)", which is the famous cake and ice cream shop every Yangon people know it. 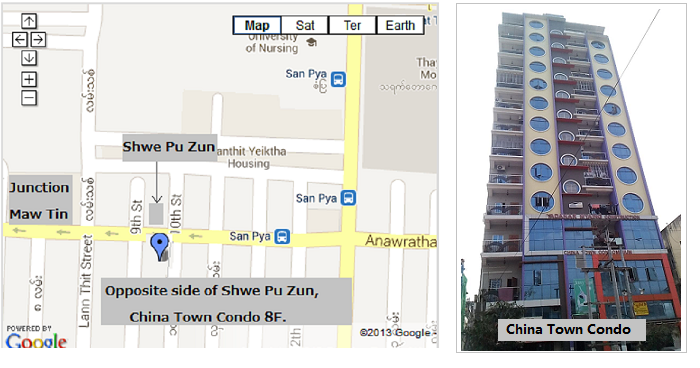 Our office is on the opposite side of Shwe Pu Zun, China Town Condo 8F.